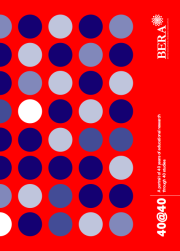 As part of our 40th anniversary celebrations, BERA has collected together a set of 40 landmark studies that have had a significant impact on educational policy, practice, research methodology and/or theory over the past 40 years. The final 40 come from across the UK (and beyond where they have had substantial impact in UK settings), from a range of academic disciplines, from researchers of every background and every perspective, and from a range of qualitative and quantitative research traditions. Accompanying the list of 40 is a publication which provides details of the studies themselves and the policy context in which they were published.